I had an interesting visit to the Long Spit at Marion Bay a couple of days ago, but not for the reasons I expected. I had chosen an early morning with a high tide, in the hope of seeing waders and terns. I did indeed see Crested and Caspian Terns, together with the usual Kelp, Pacific and Silver Gulls, but the waders were a bit light on, only recording Pied and Sooty Oystercatchers, and a small number of Hooded Plovers. As I neared the end of the Spit, and right at the end of the vegetation covered dunes, I heard the unmistakable call of a Crescent Honeyeater, and went to investigate. 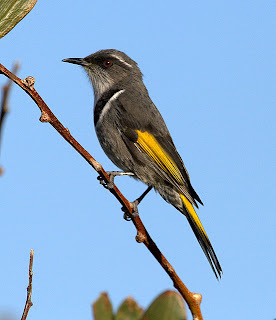 It's not unusual to find honeyeaters among the wattles almost anywhere in the dunes, but they're much more likely to be New Hollands, but this morning there were only Crescents. 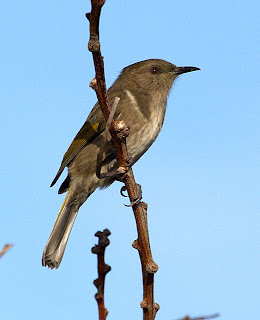 Crescent Honeyeaters are usually found during the Summer months, in wetter areas, or at higher elevat ions, moving into the coastal strips and suburban gardens during Autumn. It will probably be a month or two before they return to my suburban garden, but here they were definitely on the move. I sat in the dune and began to photograph them as they reached the last vestige of bush, and several males called from the top of the low growing wattles, stopping briefly to chase one another or the odd female. While I sat there waiting, I noticed that small groups of two or three birds, were actually crossing the Marion Bay narrows to the wooded area several hundred metres away to the South. I had noticed movements of birds across this 'gap' before, but they were mainly New Hollands, Silvereyes and Eastern Spinebills. These Cre scents were probably from the Wielangta Forest, several kilometres away to the North, as they were notably absent there on a recent visit. 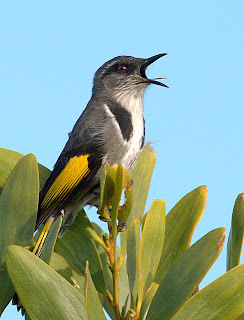 I've often wondered why these honeyeaters are so vocal during the non breeding season, some males singing from the very tops of trees, seemingly competing in song, with other, equally vociferous, males. Possibly they're claiming rights over feeding territory, as generally speaking, these honeyeaters are not a flocking species. The females are noticeably smaller, and as you may see in the lowest image, sport a much plainer plumage. During my half hour vigil, perhaps 30 birds left, males outnumbering females, to cross the narrows, all being quickly replaced by other individuals. At one point I thought the 'procession' had finished , but they had seen what I had failed to see, a passing White-breasted Sea Eagle. I had my back to it, but should have been alerted to it by the larger gulls calling loudly, with a few daring to harass it. After a few minutes, the flights resumed, but I had had my fill, and moved on to watch and photograph the Crested Terns, perhaps I'll post more on that later. Great photographs on your blog. You're a great photographer. The information on your blog, is really interesting, I'll keep check on your blog for sure. Thanks for commenting. I'm afraid the reality is that I have good gear and spend a lot of time birding, and always carry a camera! Some days it all goes to plan, more often it doesn't. Bird photography is as much about knowledge of birds and good bush craft, as it is about photography. With digital photography, it's possible to get adequate results, that, had they been taken on film, would have been binned. So it looks better than it often is!! I've visited your blog and see you're an aspiring bird photographer too. "Happy Hour" at Gould's Lagoon.